I’ve been traveling for seven weeks now, and I thought I had this whole solo bike touring thing dialed. Laos has taught me otherwise. 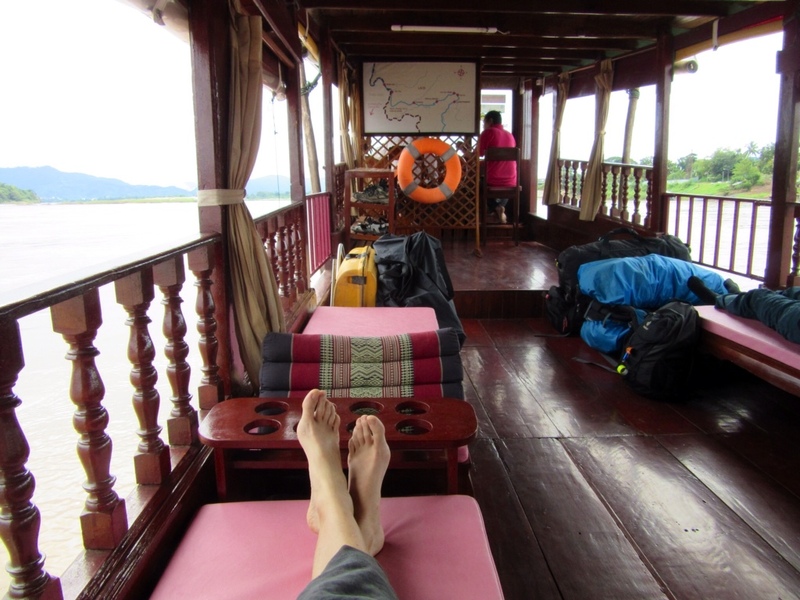 My time here started out easy enough, with a languid two-day boat ride down the Mekong River. 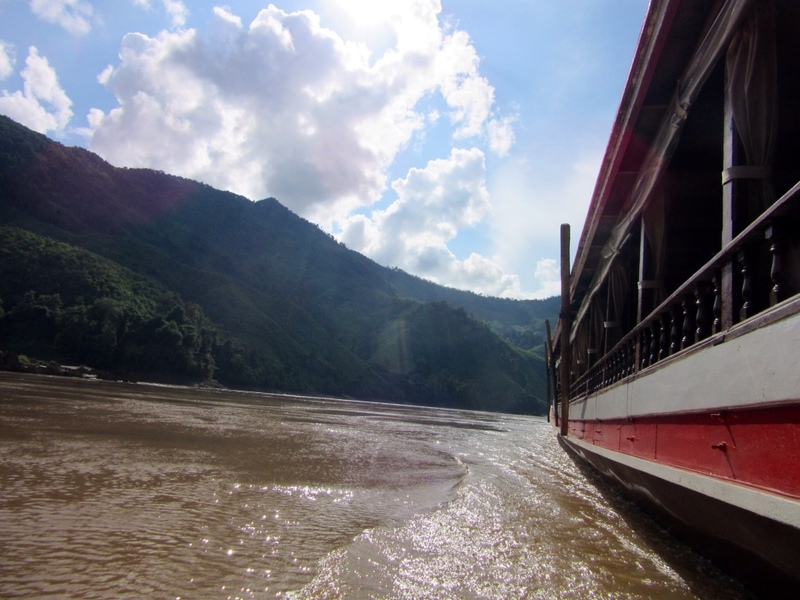 After hearing horror stories about the overcrowded, beer-soaked public boats that ply the river between the Thai border and Luang Prabang, I decided to splurge on the “posh boat.” For two lovely days I cruised slowly down the river, sprawled on a comfortable cushion, drinking tea and watching the countryside drift past. Sunset over the Mekong. Consider the pink dots a not-so-subtle foreshadowing. 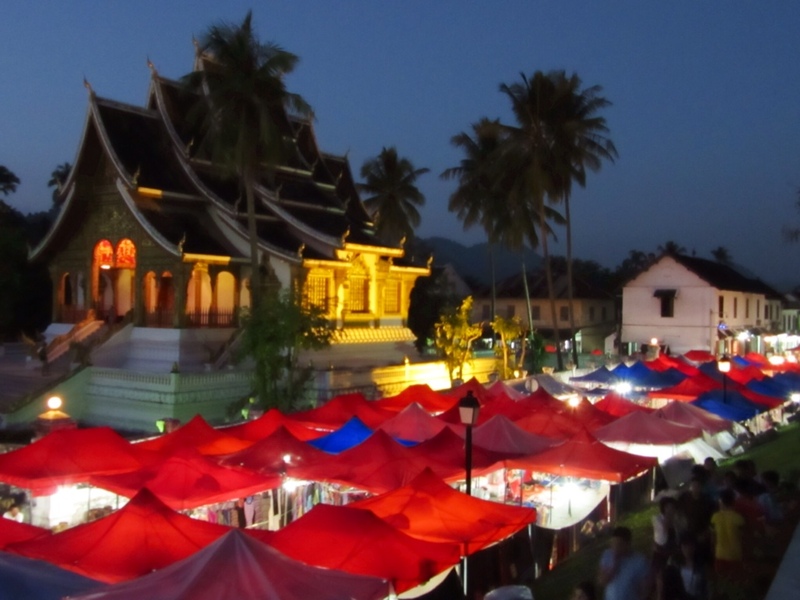 Our boat arrived in Luang Prabang at dusk, and I was immediately struck by the seductive beauty of the city, a classy blend of French colonial and traditional Lao/Lanna influences. 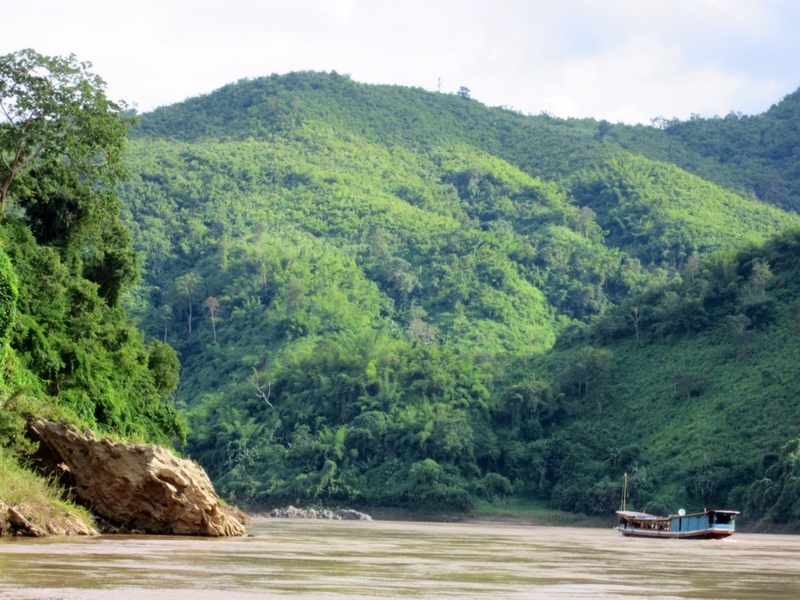 The Laos I’d seen from the river was rural, poor and not in a hurry. Luang Prabang shared that laid-back attitude, but was undeniably sophisticated in a way I’d not encountered anywhere else in SE Asia. It managed to be at once dynamic and peaceful, dreamy and authentic, touristy but on its own terms. 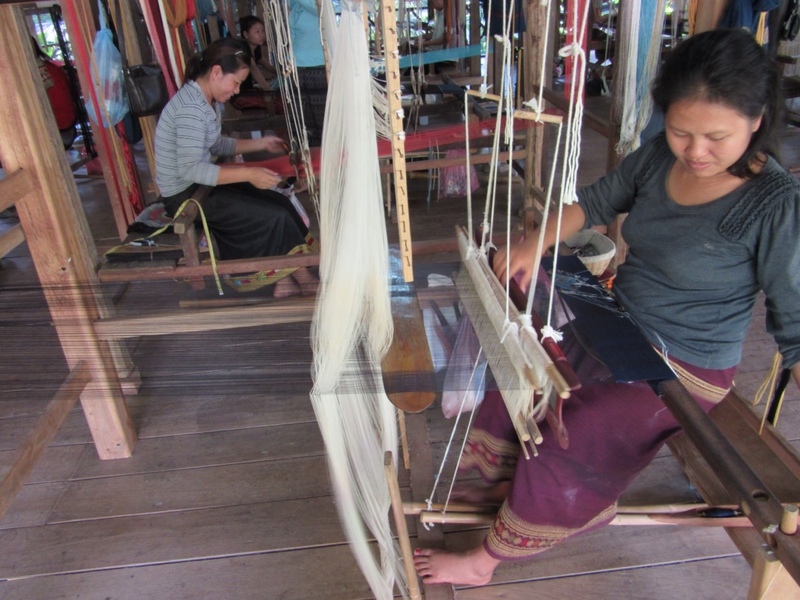 I spent the next few days wandering happily around Luang Prabang’s street markets and shady lanes, indulging in baguettes and red wine, and learning about traditional weaving and the women who sustain this rich cultural heritage. 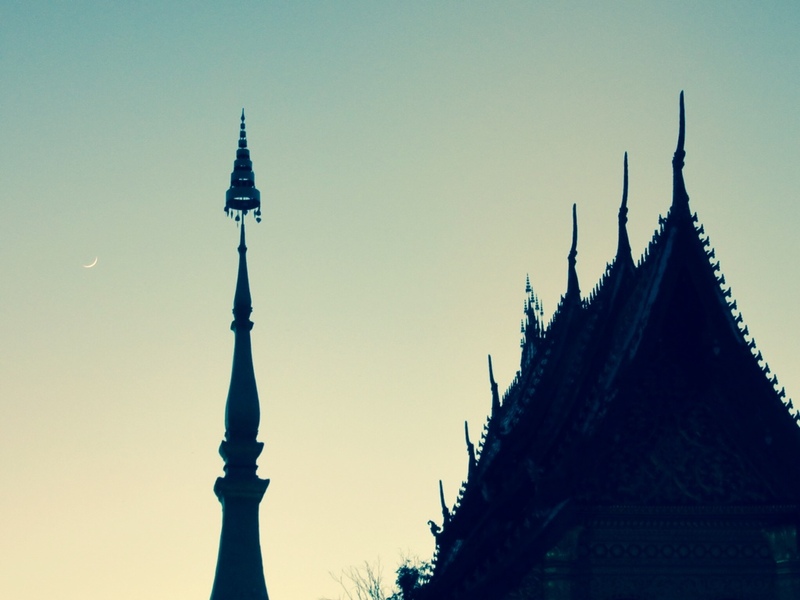 Really, you should just go to Luang Prabang. But I had a bike trip to get on with, so after three days I somewhat grudgingly packed up my stuff and prepared to get on my bicycle once again. 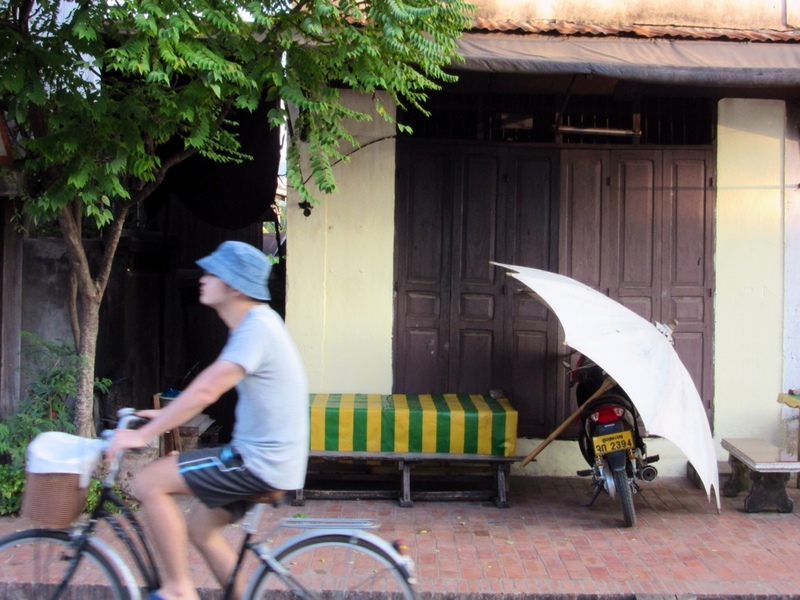 Also somewhat grudgingly, I started taking malaria pills (malarone), which my doctor had insisted on for Laos, saying that bike travel made me more likely to contract the disease than regular travelers. Despite my doctor’s advice I had been reluctant to take the pills, having read and heard about all the nasty side effects. 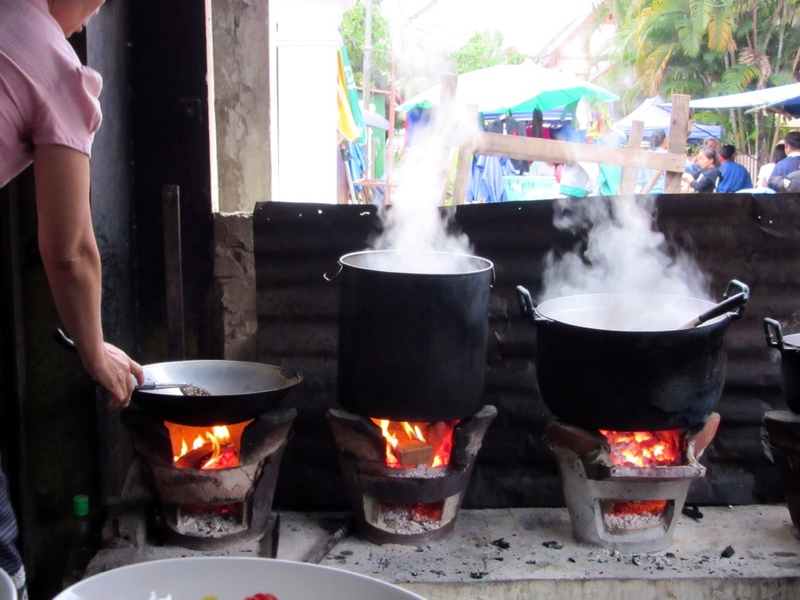 But then a fellow traveler I’d met in Thailand emailed me, telling me he’d fallen ill with either dengue or malaria. He was in remote northern Laos, very sick, and he was preparing to take a miserable 12-hour bus ride back to Thailand to seek proper medical care (which is basically nonexistent in Laos). His story scared me, and so I swallowed the first pill. And the second. Afterward I felt fine as I wandered around Luang Prabang. Alright! I thought, I’m one of the lucky ones, no side effects for me. Time to get riding. I packed up my stuff, set my alarm for 5 am, and went to sleep thinking about the ride ahead. It was somewhat famous among SE Asia bike tourists, an epic five-day tour through the mountains from Luang Prabang to Vientiane. It promised beautiful scenery, remote Hmong villages, and a series of high-mountain guesthouses where no tour buses ever stop. Having seen a sum total of ZERO other bike tourists on the road so far, I was excited about the likelihood of having other bicyclists to ride with. From blogs I’d read, I knew the first day and a half involved some steep climbing, and the trip overall was not for the fainthearted. But hey, I survived rural China, what’s the worst that could happen? The next morning I woke up in a panic, confused, tangled in my sheets. It was dark, there were voices. I lay stone still, listening, until I remembered. My guesthouse was next door to a Buddhist temple, and the monks’ quarters were just on the other side of the wall from my room. Every morning they woke up at 4 am and I woke with them, listening as they rung the bells, washed up, and shuffled off to their morning prayers. I had realized this my first night in the guesthouse. While it always woke me up, I had never felt afraid or confused by it — actually I kinda liked it — and usually I went right back to sleep. But not today. I lay in bed, trying to go back to sleep, but my heart jumped at every sound and my thoughts were as tangled as my sheets, my body limp and achy. I finally got out of bed at 6, an hour later than planned, and that’s when I realized that I was already half-dressed. Apparently I had gotten up in the middle of the night and started getting dressed, and then went back to bed. It was weird, but as a child I used to sleepwalk and I often dream vividly, so I was sure it was no big deal. Really. A few minutes later I was on my bike, rolling out of town and into the countryside. For the first two hours I biked through villages, low hills and fields. I felt sluggish, but I blamed it on the fact that I’d been off my bike for almost a week. By the time I started up the first big climb, I was in my groove. The sun was out and it was getting hot, but it was still early in the day. If I could sustain a slow steady pace through this climb and the following one, I’d arrive at the next town an hour before dark. Between here and there was only jungle, a smattering of small villages, and this steep, winding road. The hallucinations started about an hour later. To pass the time, I’d started counting butterflies and dragonflies. I was up to 23 butterflies and 9 dragonflies. Suddenly a faint halo appeared in the center of my field of vision, accompanied by a little “pop,” either felt or heard inside my head, I’m not sure which. The halo was a translucent thread, rainbow-colored, and it moved wherever my eyes went. It was odd, but otherwise I felt fine. So I kept going. But soon the halo grew wider, and then it started moving across my field of vision. It became a thick, swirling ribbon of rippling colors and geometric patterns. As my eyes moved, the ribbon picked up colors and patterns from the landscape and echoed them. A red and white road sign became a swirling candy cane. Sun-dappled leaves slithered across the pavement. It was getting harder to make out the faces of passing motorcylists. I still felt fine and I knew the hallucinations were just that, hallucinations, but I was started to get concerned. I pulled over in a shady spot, drank some water and waited to see if the hallucinations would subside. But that didn’t seem to be happening. I knew it must be the malaria pills, but I didn’t know how bad it could get. And what if it was actually malaria, or dengue, or heat stroke? As my vision continued to get worse, I really started to get freaked out. I considered my options. The next ‘town’ was 40 km away and 1500 meters above me, and it was basically a truck stop. It would take me six hours of hard riding with a fully-loaded trailer to get there. The next real town was another two days beyond that. I could maybe flag down a bus, if it wasn’t full, and if the bus driver was willing to deal with my bike and trailer. Elevation profile of the ride I was attempting that day. I turned around at about the 37 km mark. Back the other way, it was 35 km of mostly flat and downhill road to Luang Prabang, which has the closest thing to a hospital for hundreds of miles in any direction. There was also guesthouse right at the foot of this mountain. I’d passed it on my way up, and if I turned around I would speed down the hill and be there in 15 minutes. I had spent an hour climbing this hill, so the last thing I wanted to do was lose all that elevation I’d worked so hard to gain. But given the circumstances, it was the only reasonable choice. It was only 11:30 am when I checked into the guesthouse, so I spent the rest of the day resting, reading, and hydrating. I skipped my scheduled dose of malaria pills. The hallucinations subsided, and I went to bed early, thinking I’d wake up and tackle the mountain straight off. But I woke again at 4 am with a splitting headache and nausea, terribly confused and scared again. All I could think was – I want to go home! I wondered if I could get on a plane that day. 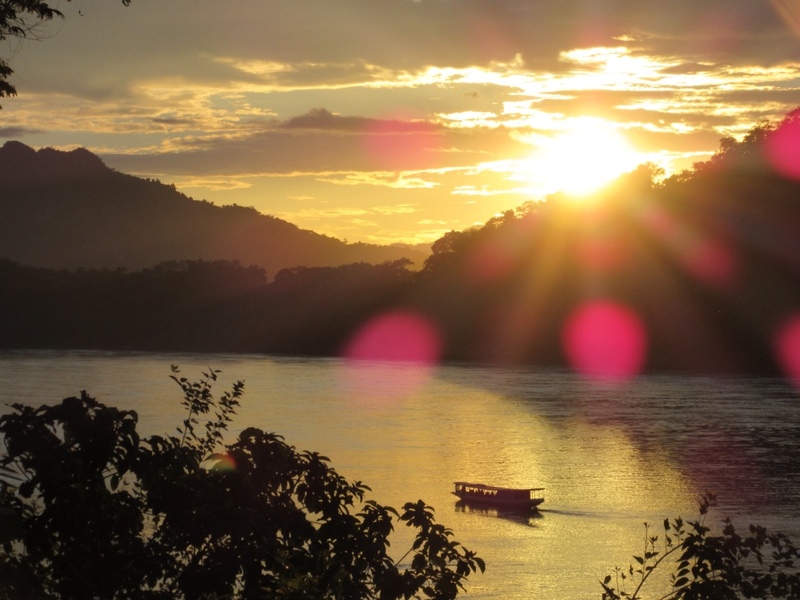 At first light, I rode for Luang Prabang. That was three days ago. I’m still in Luang Prabang, and feeling like myself again. The fear and confusion and headaches are gone, along with my imaginary rainbow. But I don’t think I’ll be trying my luck with that mountain again. While there was a perfectly logical explanation for what happened out there, it was a stark reminder of how quickly things can descend into a really scary situation. I’ve had enough. As if to seal the deal, my bike had an episode of its own. It was my first night back in town, and I was eating at the night market. I parked Totoro in a cramped row of motorcycles, and I think somebody must’ve accidentally smashed their motorcycle into my derailleur. It’s now bent, just a little, but enough that the chain falls into the spokes whenever I put it into the lowest gear. If I needed another sign that its time to stop climbing mountains, that was it. So, tomorrow I’m folding up the bike and getting on a bus. I’ll be heading over those mountains again, in an air-conditioned coach, and making my way down to Vientiane and crossing back into Eastern Thailand. While I’m disappointed that this leg of the bike tour ended so pathetically, I’ve really enjoyed having a few extra days in Luang Prabang. 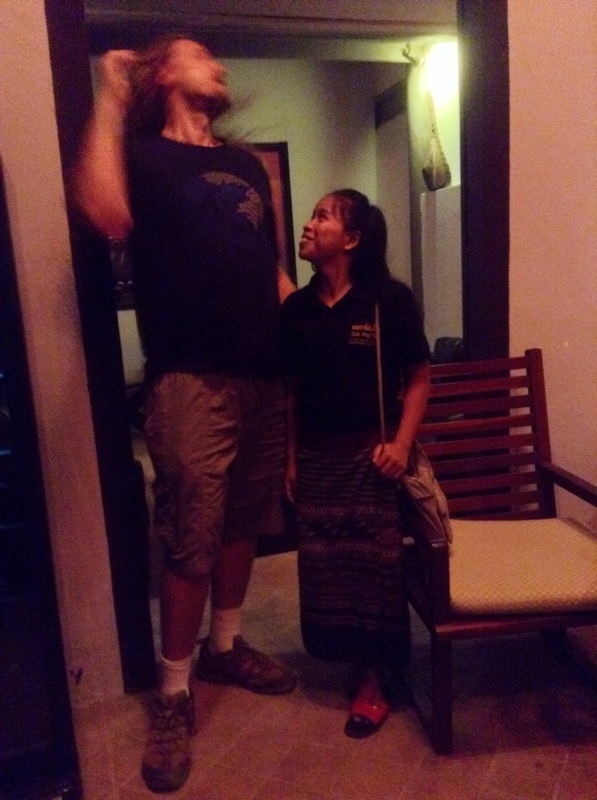 I spent several evenings hanging out with Mone, a young woman who is a weaver at Ock Pop Tok. 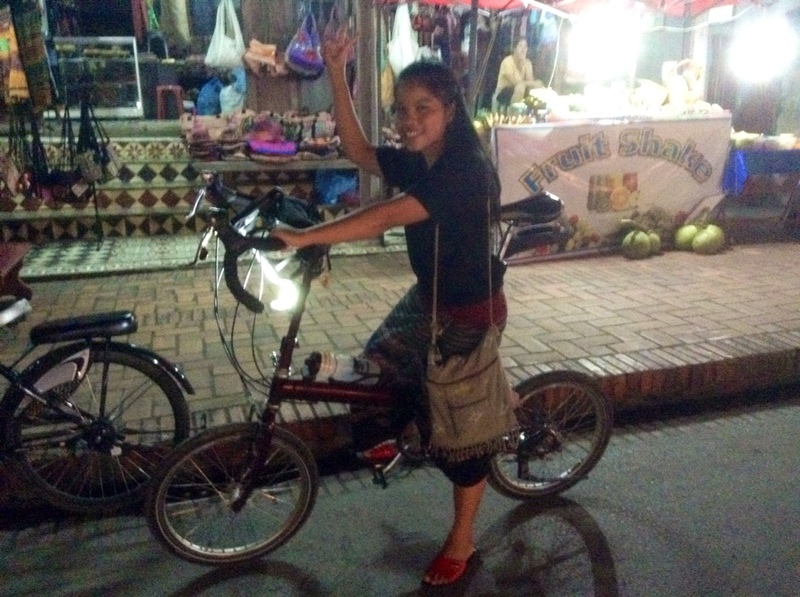 Mone is smart, funny and fearless – here she is riding my bike, which is just a tad large for her! Note where the seat is relatively to Mone. This didn't stop her from riding at breakneck speed through the night market. I also ran into Rakhal, a friend from the UC Davis Wildlife Biology program who I haven’t seen in years. Rakhal and his girlfriend Annabelle are traveling around Thailand and Laos for 10 months. According to Mone, Rakhal resembles a Southeast Asian pop star named David who is European but sings in Thai. Here is Rahkal tossing his hair in classic pop star fashion, while Mone looks on approvingly. 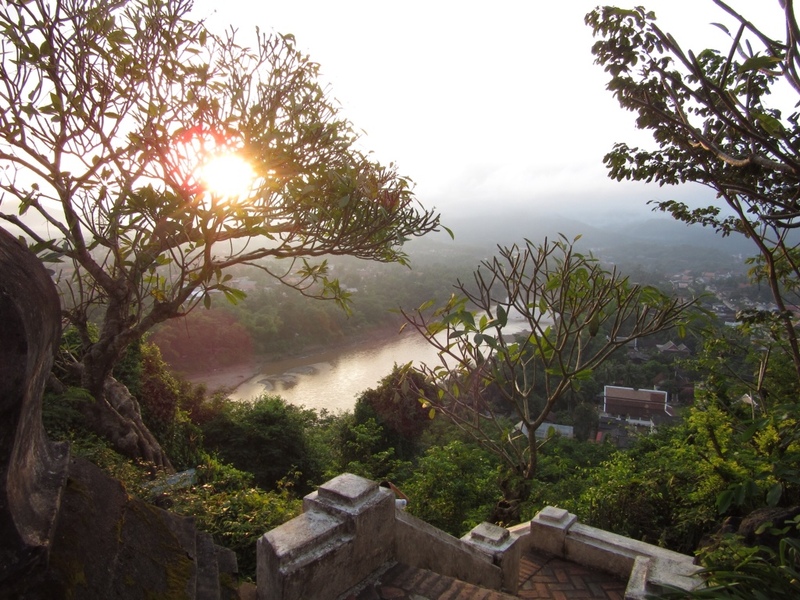 Honestly, I could spend the rest of my trip in Luang Prabang and be happy. But the road goes on, whether on bike or bus or water buffalo, I want to see what’s around the next corner. Wow! Glad you are safe!!! Sounds scary, but you made it through. And you got to see your friend and that cute woman- did she really ride your bike?? How? What a journey…thanks for the update. Autumn, I am so glad you turned back when you did! I love reading your account and seeing your photos. Thank you for sharing your great adventure with me and others. I look forward to more. Autumn, I’m so glad you’re ok! You def. made the right choice to turn around when you did. Really enjoying reading of your adventures and traveling vicariously! You made a good choice to take the bus. That trip is crazy enough via bus! Your adventures continue to amaze! Ps…now in way southern Chile!